There's a huge amount of public data available on Twitter, and a new data-visualization tool really hammers that home — developer Santiago Ortiz has mapped out the relationships between every Twitter employee based on their tweets to each other. Ortiz used Twitter's API to pull all the tweets authored by Twitter employees for a one-week period, and then filtered those tweets by only those made between employees. 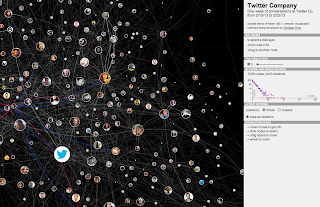 The visualization Ortiz created is almost overwhelming in its depth of detail: hovering over a user's avatar shows all the tweet-connections made by that person during the week, and clicking the avatar zooms in on that person and his or her contacts. Even more dramatically, you can click a "play" button to see a fast-forwarded view of every connection as it happened throughout the entire week — you can see small one-on-one coversations quickly branch to include more and more people. You can even click one user and drag to another to see a stream of any conversations the two individuals had. All of the information the developer used is publicly available, showing the potential for mapping networks and public conversations by using Twitter's API. Say goodbye to at least 10 minutes of your day and click the image below to play with the visualization. This Friday is the last day to apply for the 2013 Google Policy Fellowship—all applications must be submitted by March 15, 2013 at midnight PST. Please visit the website for application and program details. The Google Policy Fellowship supports students and organizations working on the critical technology policy issues of our time. Fellows will have the opportunity to work at public interest organizations at the forefront of debates on broadband and access policy, content regulation, copyright and trademark reform, consumer privacy, open government, and more. The Google Policy Fellowship is open to students of all levels and disciplines.
. Moderated by Presidential Innovation Fellow Ian Kalin, the Hangout featured Monisha Shah (Deputy Associate Director for Energy and Climate Change at the Council on Environmental Quality), Riggs Kubiak (Founder and CEO of HonestBuildings.com), and Jess Hemerly, Google. The conversation touched on the value of open public sector data to innovation in both the public and private sectors, the barriers to providing access to open data, and the future of open data and innovation generally. Back on February 21, the Department of Energy hosted a Google+ Hangout to talk about open data in conjunction with an early launch of energy.gov/data. Moderated by Presidential Innovation Fellow Ian Kalin, the Hangout featured Monisha Shah (Deputy Associate Director for Energy and Climate Change at the Council on Environmental Quality), Riggs Kubiak (Founder and CEO of HonestBuildings.com), and Jess Hemerly, Google. The conversation touched on the value of open public sector data to innovation in both the public and private sectors, the barriers to providing access to open data, and the future of open data and innovation generally. The answer may be found in four different ways. First, although departmental heads may see things differently, local government administrators do not generally view innovation as dependent on technology. We saw that a majority of respondents at both the county and city level identified shared services and compliance with new legislative requirements as the most important new approaches in their jurisdictions in the last five years. Some of these projects may involve technology, but initiatives that required technological infrastructure—an open government project, or a new town website, for example—were mentioned in only a handful of responses. Second, community resources and vision have a lot to do with how technology is integrated into an administrator’s understanding of innovation. The economic downturn in California has put local governments in a tough spot. But the pain is not felt equally across municipalities. Our interviews reveal significant divides among different types of local governments. While administrators in communities with greater resources report that they prioritize programs in which technology is a key component, smaller and poorer communities are far less concerned with adopting new technologies. And of those cities and counties who report having limited capacity to adopt new approaches, the vast majority are rural, and none are urban. Third, lack of concern over the adequacy of technological infrastructure may have more to do with the fact that local government leaders don’t believe they have the time or human resources to use technology effectively. Cost may not be the key consideration in these cases. Our survey reveals that a lack of time for employees to implement the solution, lack of qualified or skilled personnel, and lack of sufficient managerial capabilities are all much more important than adequate technological infrastructure (Table 2). Finally, the technological solutions that many local governments pursue don’t actually cost all that much. An assistant manager in a large city in California told us that while much of the opposition to transparency measures adopted in his city originally centered around financial concerns, in fact, the new policies of posting meeting announcements or contracts online cost the city very little. These survey results give us some clues into how local government officials perceive the relationship between cost and technology. But they also show that for many city and county leaders, technology just isn’t that important when viewed alongside other ways of responding to community or organizational needs. Convincing them otherwise will require reframing the value of technology to show how tools can meet needs that cities have already identified as important. We also need to show the affordability of certain kinds of technology and how cash-strapped cities and counties can embrace those solutions. In general, how important are the following reasons for adopting new approaches in your city or county? (Very Important, Moderately Important, Slightly Important, Not Important, Not Applicable; these descriptions were assigned numeric equivalents on a 4 point scale in order to generate a ranked list of mean responses). Over the course of the last five years, how significant has each of the following factors been in your choice to use acquired knowledge in decision-making or your decision to implement and sustain new approaches? (Very Important, Moderately Important, Slightly Important, Not Important, Not Applicable; these descriptions were assigned numeric equivalents on a 4 point scale in order to generate a ranked list of mean responses). Note: The tables in this post summarizes data from a survey conducted by the New America Foundation’s California Civic Innovation of county administrators and city managers in California from November 2012 through January 2013. The sample size was 78, comprised of 24 county administrators and their deputies who belong to the California State Association of Counties (CSAC); 34 city managers and their deputies who belong to the California division of the International City/County Management Association (Cal-ICMA); and 20 city managers and their deputies who do not belong to Cal-ICMA. Rachel Burstein is a Research Associate at the New America Foundation's California Civic Innovation Project. Technology provides tremendous tools for local government leaders hoping to better serve community needs. Consider the efficiencies created by online payment systems, or the potential for community improvements through the publication of open data sets. Unfortunately, however, local government staffers often don’t recognize technology as important or valuable. In order to change these attitudes, technologists, citizens and others will need to articulate the value of tech to fulfilling central governmental functions. The New America Foundation’s California Civic Innovation Project recently concluded a survey of city managers and county administrators in California. We found that of a list of ten motivations for innovation, reducing costs was by far the most important factor (Table 1). City managers and county administrators do not regard inadequate technological infrastructure as a noteworthy obstacle for innovation. Instead, financial considerations are judged to be much more important (Table 2). So, what gives? Given that there is often a correlation between cost and technology, are we to assume that local government administrators simply don't regard technology as important to the innovation process? Or is something else going on?